Cam Knights in the thick of a halftime huddle on tour in New Zealand. 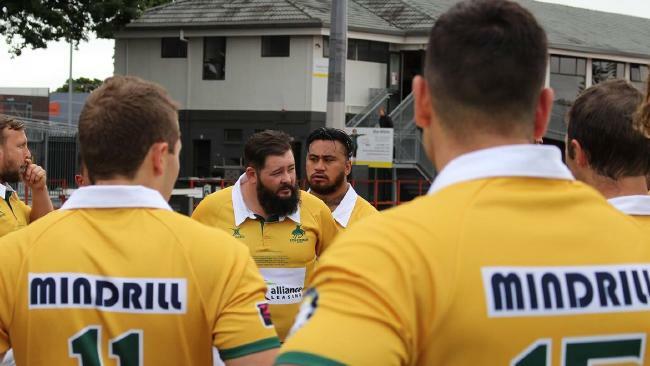 IF billionaire Twiggy Forrest is looking for teams to get his Indo-Pacific Rugby Championship off the ground, maybe he should take the St George Frillnecks and burly farmer props like Cam Knights to the world stage. 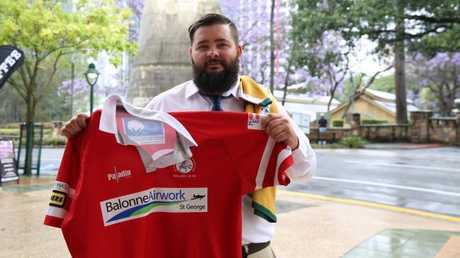 You don't get more grassroots than this passionate outfit from country Queensland or Knights, who has come up with $5000 to pay his way to play on one of rugby's old school tours. Knights is finishing up a five-game tour of New Zealand and Argentina with the Australian Stockman, an initiative that uses rugby touring to offer personal and athletic development for players from far-flung points of regional Australia. Stockman Josateki Roqica-Murray, formerly of Cairns Brothers, on the fly against Papakura. They play in gold jerseys but theirs is not the five-star hotel life of the Wallabies and the only use for the TMO would be to identify those players who wilfully stop drinking early during post-match revelry. Teachers like Caloundra Rugby's Josh Adams and Trent Devere, from the Fraser Coast Mariners, answered the call-out for players to tour. There are electricians, a cabinet maker, a policeman, a surveyor and university students in the squad. Players joined from Melbourne to the Burdekin in North Queensland. Stock and station agent Simon Newton, from the Walcha Rams, bangs over the goals. The coaching is in the hands of two former Wallabies, Chris Roche and Tony Melrose, the five-eighth who entered folklore on debut in Australia's memorable 30-16 upset of the All Blacks at Auckland's Eden Park in 1978. Knights, 24, has a beard so healthy it looks like it has copped some stray fertiliser during his work on the family cattle farm outside St George, 390km west of Brisbane. He toured Ireland with the Stockman in 2015 and enjoyed it so much he backed up for this year's adventure without knowing he'd be playing with former Reds and Brumbies prop Ben Coutts. 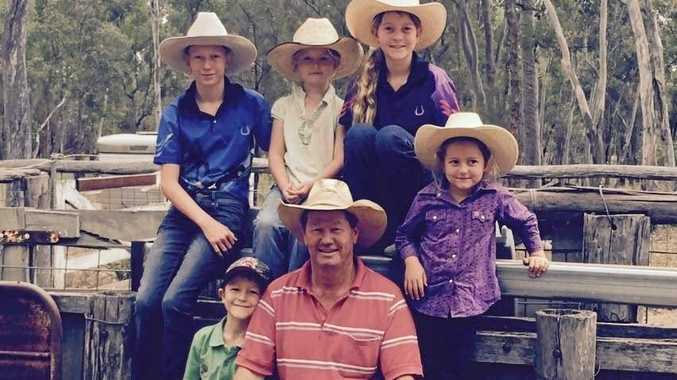 A regular week for Knights is devoted to irrigating, the tractor, keeping fence lines intact, cutting mulga in dry spells and making sure feed and water are sufficient for stock. The first good fall of rain in a year before his recent departure on tour came at just the right time. "The Stockman is a really good initiative for boys from the bush ... it's an opportunity of a lifetime to be honest," Knights said. "It's not a 'professional' tour but still based around one with fitness regimes, different strategies and the extra perspective you get for the game because Chris and Tony have played at such a high level. "It's still rugby once you get down to the guts of it all. "I'm sure the Wallabies have great fun on the tours they go on too but there's not the pressure or a nation looking at us." 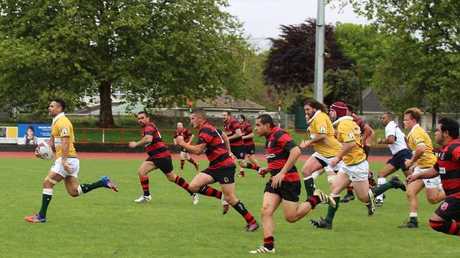 Beating Papakura (36-19) and Auckland Police (27-17) was an excellent start when Guy Shepherdson, the former Wallaby, joined the squad for the New Zealand leg. 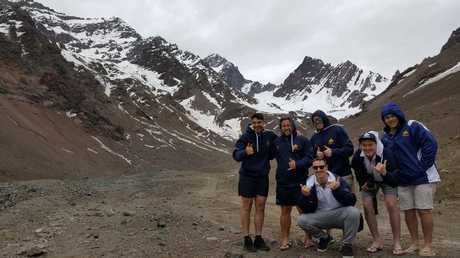 Backing it up with a victory over Los Tordos (33-17) in Mendoza enriched the tour even more because they also beat high altitude heat for the first time and a massive post-match barbecue where Richie Smee, from the Caloundra Lighthouses, must have eaten half a cow. Club Athletico del Rosario (62-0) were dealt with before the Stockies hit Buenos Aires to play Banco Nacion, the club of Argentinian great Hugo Porta. Roche is renowned for his dry sense of humour and this line was typical: "The things we put ourselves through for a cold beer." The Melrose power stance is well known too because he has a cowboy's lean wherever he enters a bar. Knights likes a quiet rum and a noisy one too. It's not scrummaging laws he wants more harshly policed but not drinking with your right hand. What would a rugby tour be without drinking games, awards, the Anchorman microphone style of Toowoomba's Tom "Kegs" Caskey, a coach ride through the Andes, "Waltzing Matilda" as a team song and a full-throated "cooee" from the Stockies. "It's well appreciated the time that Rochy and Tony give to the coaching and you hope a bit of what we learn flows on to the country clubs we all play for," Knights said. "It's not until you watch some old video of them playing for the first time that you fully appreciate that we've got such legends involved." Knights will return to the Frillies, a spirited club that has bounced back from a rough trot where a 101-0 loss was part of an extended drought of 54 matches without a win. "The playing numbers aren't the worst in the world. We average 16 to training and game days we will have two or three reserves," Knights said. "We made the finals this year ... a good season. "I love how bush footy is played ... simple footy played really tough and time to catch up with your mates." The Stockman on tour ... from bush rugby to the Andes. Now the Argentinians know as well. Rugby and touring have a way of bringing people together and the Stockman rugby program has evolved to include mental health and wellbeing workshops, alongside chasing the footy, post-match beers and the building of team spirit. "While we're building and developing athletes, we're reaching them with education and awareness around suicide, depression, substance abuse and domestic violence," founder Shaun Mackin said. "By having these group discussions, we are challenging the stigma of talking about mental health and wellbeing in a safe environment, challenging players' own behaviour and what their interpretation of what is and is not acceptable. "The rugby always comes first but the other aspects of it like the personal development for some guys who haven't even been out of their own state, let alone the country, comes with it as well.